Do you need a state-approved bartender certificate to serve alcohol? 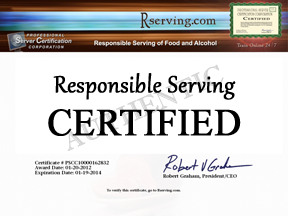 Many areas in the United States require that anyone who sells, serves or handles alcohol must be certified or take a responsible alcohol serving course. Professional Server Certification Corp (PSCC) offers state-approved online courses which will help you get certified as an alcohol seller, server or bartender. In addition, all of our courses are completely designed to be taken online. This means you are able to access and take the course through any device that has access to the internet; including handheld devices like tablets, notebooks, or even your smartphone. Professional Server Certification Corp is backed by professional staff members that are willing to answer any questions you might have. PSCC can also accommodate you with an Employer Account if you are looking to get your entire staff certified. 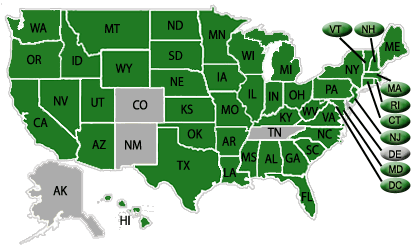 Order your state's "Responsible Serving® Course"
Choose a state to see state requirements and approval information for that state. Requirements are based on state and county regulations. Click your state to determine if our course meets your state's requirements.